Fresh homemade Strawberry jam made without pectin, it is so easy and yummy.it is made with three ingredients.It is a very simple recipe and serves with bread, donuts filling, pancake etc. 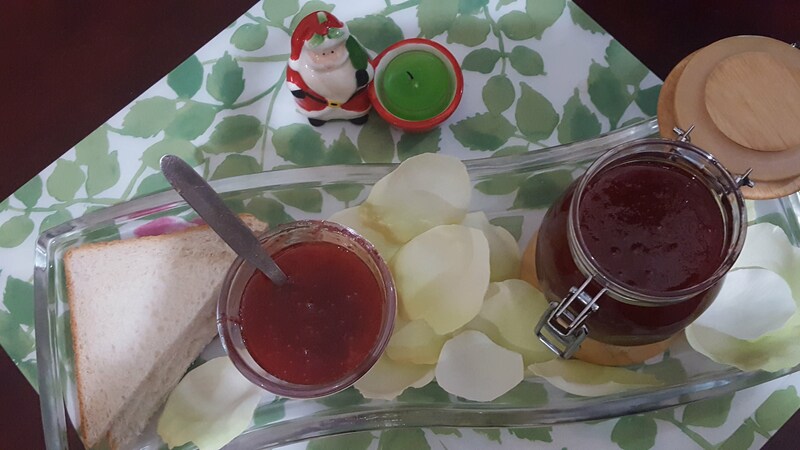 Jam can be consumed directly by applying on top toasted bread especially for breakfast. First, prepare the strawberries, by washing them (but not soaked) and then wipe them with a piece of damp kitchen towel or paper, cut into small pieces. Take a large pan, add strawberries and sugar and heat over a low flame, mash strawberries with a masher until the sugar completely dissolved, stir continuously. Once sugar is dissolvedcook15- 20minutes.Check jam is ready to take a cool plate and place a small amount of jam on the plate left for 1-2 minute and push your finger through the jam, if it does not come down, wrinkled there jam is ready. Once the jam is ready to remove from the heat, after cooling jam, take sterilize jar fill it.